The Frantic "gang" is back with a lovely slab of wax in 10 inches. Love is all around on this release consisting of a bunch of cool garage stuff ranging from swinging to moody and from self-penned originals to obscure covers. Side A's opening track titled "I Believe In You" is an excellent starter with moody feeling in vocals and lyrics, equally fuelled with cool Farfisa organ and fuzz guitar. "Ain't Gonna Cry No More" is the follow-up number, a fuzz guitar and organ driven track with fine vocals. 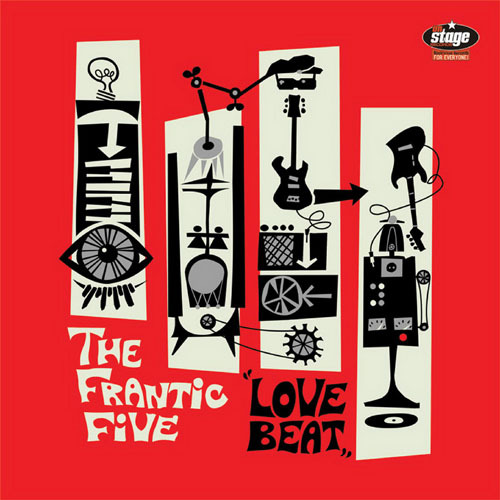 The Frantic Five have repeatedly proved in their 17-year career that they always kindly treat all the original stuff from the 60's paying this way tribute to the originators. "High Flying Bird" originally composed by a country-folk crossover singer-songwriter named Billy Ed Wheeler, gained recognition in the late 60's by an acid-folk version of Jefferson Airplane. In fact, the band's treatment on this track is a very successful cover version of the 60's teen punkers of Plague. Hats off in all three tracks of Side A to Dr. Organ's wonderful vocals! "I Need Your Lovin'" on Side B is a cool and swinging tune based on a "frantic" tempo and cheesy Farfisa that brings to mind the early days of the band, back in the mid 90's! Same goes also to the title track "Love Beat" which is a lovely up-tempo garage beat song (with a hint of Merseybeat!) with great vocals that would perfectly fit into a party set. The record's last track is yet another exceptional cover version, "Bad Day Blues" of The Headstones with fuzzed-out guitar and killer Farfisa! "Love Beat" is one of the most mature attempts of the band, an essential record for every garage maniac's collection!! !